With its 16.1MP backlit CMOS sensor and built-in Wi-Fi capability, the Canon IXUS 240 HS - known as the Canon PowerShot ELPH 320 HS in the US - is just the kind of camera you might see poking out of a shirt pocket on a Côte d'Azur beach. It's certainly been designed with style in mind, but it's also brimming with technology, including built-in Wi-Fi for uploading photos to Twitter or Facebook, a sensor that claims to perform well in low light, and a touchscreen that does away with all the buttons you'd normally expect to see on a digital camera. If gimmicky is your bag then you'll positively flip over the range of built-in filters and various shooting modes. For example, you can choose to shoot with a Smooth Skin filter, Fish-Eye, Soft Focus mode and many more effects that few would dream of using. Like them or not, they're there if you need them, along with movie modes including Full HD video shooting and stereo sound, which can be invoked by pressing a red dot on the LCD screen. 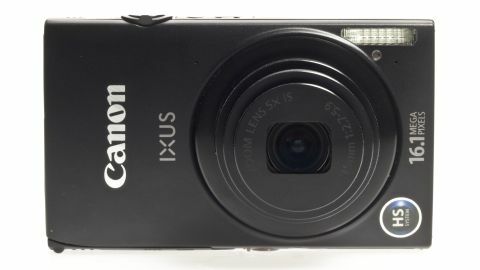 The body of the Canon IXUS 240 HS is wrought from smart matt black aluminium and positively oozes high quality, apart from the cheap plastic flap hiding the USB/mini HDMI ports and the battery cover, which feels as if it wouldn't last five minutes in the hand of any self-respecting toddler. Frankly, that's not really acceptable for a compact camera that costs £279 in the UK and $279.99 in the US, where it's called the PowerShot ELPH 320 HS. This price puts it at a similar level to the Panasonic Lumix FX80, Ricoh CX6 and Pentax Optio VS20. All the controls except for the On/Off switch and Playback button are accessed via a 3.2-inch (8cm) LCD touchscreen that takes up the rear of the camera. It's a bright screen but it does have two major faults: a tendency to put too much punch into the images so that highlights look burned out, and an infuriatingly insensitive touch system that forces you to jab at the screen, over and over again, just to select an option. After five minutes of pointing and pressing you find yourself exasperated and yearning for the old days of buttons and jog-dials. This tedious aspect of the camera really does make you think twice before changing options such as metering modes or white balance. Fortunately, most of the functions you might want to change are handled fairly well in Auto mode, but it's still a hassle when you do want to make a change. When it comes to settings there are plenty of them in hidden away in a slightly Byzantine menu system. Unfortunately, the faff of trying to set them by touch and then using a finger to scroll through the options can prove a disaster with even slightly fat fingers. Twice during one session a finger slipped and the Reset All Settings button was pressed, which was almost enough to trigger a nervous breakdown. In short this camera isn't pleasurable to use if you enjoy fiddling with settings. Perhaps the biggest disappointment when it comes to usability is the Canon IXUS 240 HS's built-in Wi-Fi function. The software supplied with the camera has a touch of Fisher Price about it, so setting everything up should be straightforward. Alas it wasn't for us. The camera kept disconnecting itself from our computer, and when we did manage to set up the Twitter and Facebook modules, the results were disappointing. When you upload a picture to Facebook, the image is hosted on Canon's Image Gateway website. Unlike a smartphone that uploads your images directly to Facebook, the Canon solution merely posts a link with a preview. It's clunky and unreliable and Canon clearly needs to rethink the whole Wi-Fi deal, possibly by putting some software into the camera that can upload directly to social media sites. The camera could also benefit from an interface that makes logging onto a wireless access point less of a tearful experience.